Stay compliant with state prescription drug monitoring program regulations, improve patient safety and increase productivity with the PMPReport platform. With over 10 years of experience, our team has the knowledge and expertise to address the complexities and challenges associated with state prescription drug monitoring program (PMP) reporting. Using our simple and streamlined process will allow you to boost productivity and make resources available for other tasks. State PMP agencies can vary widely on such things as drug monitoring lists, report formats, reporting frequencies, and laws for noncompliance. Our complete PMP management system will give you complete confidence in compliance with PMP requirements. 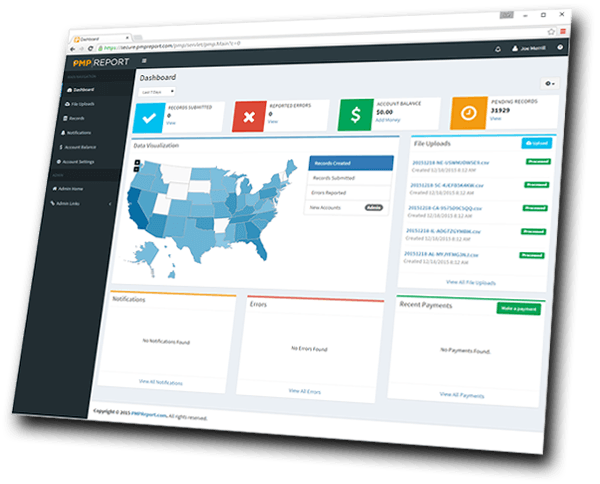 With PMPReport you submit a single data file whether you report to a single state or many, and pay only for the records you submit. Submit a single data file whether you report to one state or dozens. 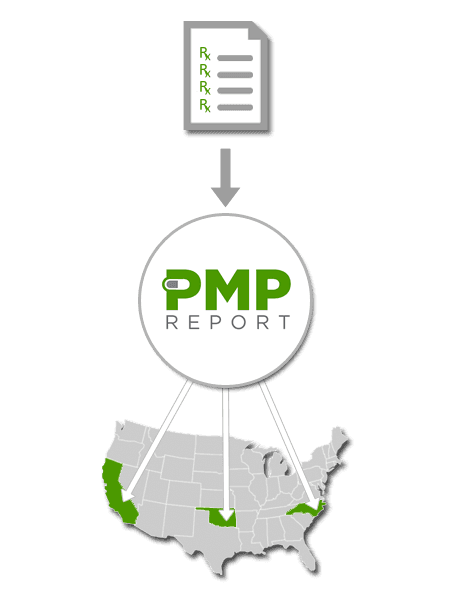 The PMPReport system automatically breaks the data file into separate state reports, formats the data per state requirements, and submits the reports to the appropriate state prescription drug monitoring program agencies. Our system peforms a series of checks on your data immediately before any files are submitted to the state agencies. This allows you to fix issues quickly and avoid delays in reporting. Our system stays up to date with complex and ever changing state PMP requirements for controlled substances. Let our team of experts handle the complexity of PMP reporting while you spend you time on other activities. Our secure web based platform allows you to submit data and check the status of your reports from anywhere on any device. Receive customizable email notifications so you can stay up to date with the status of your reports. Built with the latest SSL security and firewalls you can be sure your data is protected. Our servers are hosted in a secure data center and we routinely perform security scans to check for any issues. Receive immediate support from our team if you run into any issues or have any questions about the system. We maintain relationships with state agencies and can address issues quickly. Manage all aspects of prescription drug monitoring program reporting with our simple and secure platform. Pay only for the dispense records you submit, add funds to your account at any time. A record is a single dispense of a controlled substance to a patient. One zero report is required per dispenser per reporting period. Reporting periods vary by state. Add a mininum of $10 to your account at any time. Get in touch with us if you have any questions or if you'd like to create a new account with PMP Report. A member of our team will be in touch with you shortly. All the new Bill summaries that FL passed this past legislation session.